In a nation obsessed with property and homeownership it comes as no surprise that many Brits go one step further than buying their family home, and decide to invest in property to let. However, the only thing these two endeavours really have in common is bricks, mortar and usually a mortgage. Buying-to-let is a world away from purchasing your own home, and you need to approach it with a completely different mindset. Established landlords run their portfolios like a business, and never let sentiment get in the way of decision making. But an increasing number of first-time buy-to-letters are now dipping their toes into property investment. Ian Potter, operations manager at the Association of Residential Letting Agents, says: "Investing in a buy-to-let property has always been an attractive opportunity, and the high demand for rented property means there is a growing number of first time landlords in the market." And although many are motivated by rocketing rental demand, others simply decide to let their home because they cannot sell it, yet they need to move. A job relocation or growing family often forces their hand. In fact, according to buy-to-let lender Platform (part of The Cooperative Bank), these 'accidental landlords' account for a fifth of its recent business. Lee Gladwell, business development director at the lender, explains: "Uncertainty around the economy, employment and house prices is continuing to dampen demand for house purchases and drive demand from renters." "Some people who want to move but are unable to sell are choosing to become landlords and rent out their existing property, at least until the market improves." The first rule of choosing a property to let is not to think about where you would like to live, but to view it as a business decision. A cosy cottage in the middle of nowhere may seem idyllic but most renters want good transport links and local amenities like schools, shops and hospitals nearby. Find out which type of properties let well in your area and the best neighbourhoods for buy-to-let. A good local letting agent will be invaluable here – look out for those registered with the Association of Residential Letting Agents (ARLA). Making the right decisions around the funding of your buy-to-let investment is crucial and professional independent mortgage advice is a wise move. After all, while many high street banks and building societies offer buy-to-let deals direct to the public, there is a swathe of lenders that you can only access through a mortgage broker – and they specialise in landlord mortgages. In addition, you get the benefit of personalised advice from a qualified professional. You can't just jump into buy-to-let without doing your homework – or paying a letting agent to do it for you. Letting property goes hand in hand with rules and red tape, from ensuring your furniture complies with fire regulations to adhering to health and safety requirements for gas and electricity. There are also tenant deposit schemes to sign up to, careful vetting of potential tenants and the production of a thorough inventory for the property and its contents. Finally, ensure you have adequate insurance to cover the buildings, contents (if furnished) and possibly even your rental income. In other words, you must dot all of your 'i's and cross your 't's. Forget 'get rich quick' schemes. Buying-to-let is a long-term investment. First of all, capital appreciation is likely to be limited with property prices in the doldrums. Secondly, although rental demand, and income, is high, you still need to plan and budget for voids, repairs and, most importantly, rising interest rates. And thirdly, it is more tax-efficient to hold onto your property for at least 10 years as your Capital Gains liability is reduced with taper relief over that period. It's essential that you think about why you are investing in property, and what your exit strategy is – do you want the property to provide you with a pension in retirement for example? Do you have a plan to repay the mortgage at the end of the term? If you have any money left over from your rental income after your mortgage has been paid you should put in an instant-access savings account to give you a safety net. After all, if your tenant moves out and you don't replace them immediately, you still need to meet your mortgage payments in the interim (ARLA recommends first-time landlords budget for at least eight weeks of voids in the first year). Equally if the boiler breaks down you will have to find the money to get it fixed quickly. Problems can and do occur frequently when you rent out properties, so a savings pot is crucial to cover them. If you still have leftover rental income, the most savvy move you can make is to overpay your mortgage and reduce your debt. While it is essential that you keep some money aside for essential maintenance and void periods, you should also speculate to accumulate. Most experts agree that a property that is presented well will let faster and attract better tenants than a tired and scruffy place, so it is worth spending a little money to create an appealing home. Similarly, nipping repairs in the bud may have an initial outlay but will prevent larger problems occurring and could save you a fortune in the long run. 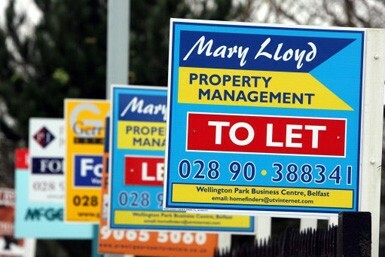 Another wise investment could be to use a letting agent to find and vet tenants and manage your property. There is a hefty charge of around 10% of the rental income but it can be money well spent – not only will they give you a watertight tenancy agreement, they are invaluable in the event of a dispute. We're not quite sure that the bear adds anything to this listing, maybe it's meant to avert your attention from the dreary decor? The seller is obviously a horror film fan. However, it might be an idea to remove all murder evidence before putting your house on the market, even if it is fake! This real estate agent probably should have waited until the car was moved. Much like the bear in the tub, this is another bizarre bathroom addition. We don't want to know what the couple are up to in this photo. One fail-safe way to generate interest is to get some pretty girls involved. This seller obviously has their head screwed on. Estate agents tell us that a house should always be clean and presentable when people come to view. The advice obviously fell on deaf ears here.